Modified bitumen sheet membranes consist of hot asphalt combined with either plastic or rubber additives. They are often layered in between sheets of polyester and fiberglass. Their combination produces excellent weathering resistance, making them some of the most durable commercial roofing options. APP Polymer-Modified Bitumen – APP stands for atactic polypropylene. It is also referred to as thermoplastic extenders. This roofing option requires high temperatures when applied, which is why it’s usually heat-welded. SBS Polymer-Modified Bitumen – SBS, on the other hand, stands for styrene-butadiene-styrene. Compared to APP, this option is more flexible in cold conditions. It is usually installed in hot asphalt moppings or cold adhesives, creating a rubber-like effect that is extremely resistant to the elements. It also features its own adhesive backing. CertainTeed offers its own self-adhering SBS polymer-modified bitumen roofing membrane, Flintlastic® SA. It is made of premium materials, making it suitable for most low-slope roofs. It comes available in eight colors that complement most of the brand’s shingle colors. Its white option, in particular, has met the ENERGY STAR® requirements for slopes that measure 2:12 and more. 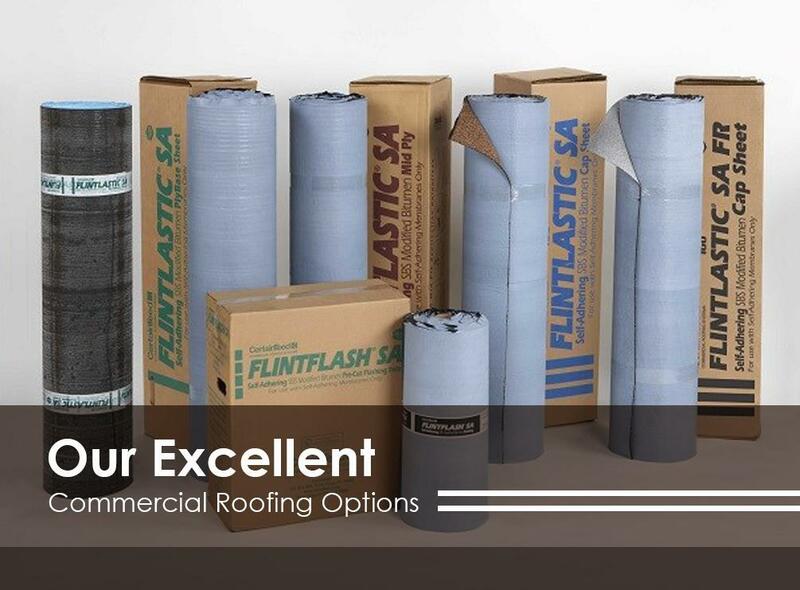 For further questions about our commercial roofing options, call us at (219) 228-8210 for Indiana or (773) 492-2270 for Illinois. You may also complete our form for a FREE estimate. We serve Munster, Dyer, and nearby IL areas such as Tinley Park.